Best peach Ice Cream I have ever tasted. 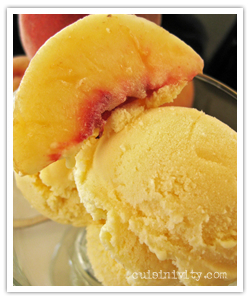 Place peaches, 3/4 cup sugar, corn syrup, and ascorbic acid in large bowl. Cover and refrigerate overnight. Puree fruit in processor until smooth. Strain, pressing on solids in strainer; discard solids. Cover and chill until ready to use. Whisk yolks in large bowl. Bring cream and remaining 3 tablespoons sugar to boil in heavy medium saucepan, stirring until sugar dissolves. Gradually whisk hot cream mixture into yolks. Return mixture to same pan. Stir constantly over medium heat until custard thickens enough to leave path on back of spoon when finger is drawn across, about 5 minutes. Strain custard into medium metal bowl. Place over large bowl of ice water and stir frequently until custard is cold. Whisk in peach puree. Process in ice cream maker according to manufacture's instructions. Transfer to container. Cover and freeze at least 4 hours.